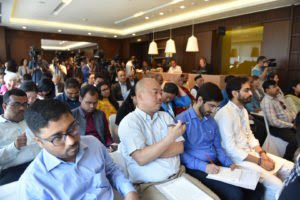 His Holiness the Dalai lama presiding over the press launch of SEE learning program at Andaz Hotel, New Delhi on 4 April 2019. The conference of global Social, Emotional and Ethical learning (SEE Learning) program held in New Delhi. The program was jointly launched by Emory University in collaboration with the Dalai Lama Trust and the Vana Foundation. 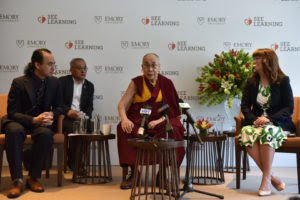 His Holiness the Dalai Lama presided over the launch conference including other distinguished guests and representatives namely Dr Daniele Goleman, Miss Linda Lantieri, and Dr. Kimberly Schonert-Reichl. The event was moderated by Mr Brandon Ozawa De Silva who is associate director for SEE learning centre at Emory University. A brief overview of the context of SEE learning program was presented by Mr. Brandon who said the program was launched on the realisation of His Holiness vision for holistic education for mind and heart. Sharing his thought on the education for heart and mind, His Holiness remarked, ‘a happy world cannot exist without human compassion, therefore, education system should include the education of warm-heartedness. Much of the world problems as His Holiness noted are created by human beings because of their lack of control over rising emotions and anger and such problems cannot be resolved by mere prayers. “Action related with motivation,” said His Holiness should be the key factor for making this century a century of peace, non-violence while affirming its possibility only through education. His Holiness then expressed his hope for the initiation to become a worldwide movement. Dr. Daniele Goleman, an internationally known psychologist and author of ‘Emotional Intelligence’ was one of the expert speakers at the event. Dr. Goleman is also the co-founder of there collaborative for Academic, Social, and Emotional Learning at the University of Illinois. Dr. Goleman talked about the impact of the learning program on students social and emotional skills. He further noted that the skills adopted by the learning program have greatly helped students dealing with violence and abuses into making good decisions. According to Dr. Goleman, the combination of wisdom and compassion is exactly what the world needs now and in the near future. “Compassion without discernment is blunt and discernment without compassion is like a dried up fruit tree” quoted Dr. Goleman and urged the need for teamwork and collaboration. Miss Linda Lantier who is associated with SEE learning as an educational consultant described her experience and conveyed that the program digs deeper into the education world not only focusing on educating mind but also educating heart and spirit as well. She cited an example of her experience with a student under the program who showed that the skills and knowledge learned through the program have indeed made an impact. “SEE learning is giving the children a better way now our job as an adult is to make ourselves ready with that challenge” attested Miss Linda. All the speakers extended their heartfelt gratitude to His Holiness for his support and wisdom in making this launch event a successful one. 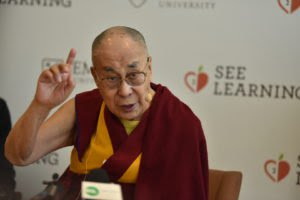 Tomorrow His Holiness will attend the main sessions of the SEE learning global launch program in the morning.